In honor of Father’s Day coming up, here’s an excerpt from At Home in the House of My Fathers, which includes never before translated essays and sermons from some of the fathers of the Missouri Synod. Translated from: “An die deutsche ev.-luth. Gesamtgemeinde Ungeaenderter Augsburgischer Konfession zu St. Louis,” in Briefe von C. F. W. Walther an seine Freunde, Synodalgenossen und Familienglieder herausgegeben von L. Fuerbringer (St. Louis: Concordia Publishing House, 1914), 1:115. —M. H.
Most honored Brother in the Lord! I always think I have no time to write to express my friendship, so it has happened that I again have not once expressed in writing my thanks for all the love you have demonstrated for me. Forgive me! But now I happily note that you, by way of churchly concerns, nevertheless require me to put pen to paper. I use this opportunity, albeit belatedly, to assure you of my most thankful sentiments. But to the matter! First of all, regarding the apparent contradiction that Luther makes himself guilty of in the course of his explanation of 1 Corinthians 14, and in retrospect regarding the call of Apollos, it is just that—only apparent. And it is certainly no doctrinal contradiction. To be sure, Luther in 1523 (“That a Christian Assembly or Congregation Has the Right and the Power to Judge All Teaching and to Call, Appoint, and Dismiss Teachers, Established and Proved by Scripture”) believed that those in 1 Corinthians 14[:30 KJV] called “those who sit by” were laymen, while he later bears witness that by this word must be understood called preachers. But what does this have to do with the doctrine? With respect to the doctrine, Luther remained completely consistent until his death. As earnestly as Luther fought on the one side against the papistic doctrine of a particular priestly estate and its consequences, even so earnestly had he fought for the biblical doctrine of the order of the preaching office against the Schwaermer. To be sure, in the first struggle, Luther called upon 1 Corinthians 14, among other texts. But concerned about the false exploitation of this text by the Schwaermer, he soon recognized that this passage is not so much a witness against the papistic view, but much more against the separatistic one. But in the doctrine itself, he neither added nor took away anything. What Luther in the writing of 1523 demonstrates with 1 Corinthians 14 remains constant before and after. Luther teaches this: The Keys or the Office [Amt] are originally and immediately possessed by the entire Church [ganze Kirche], that is, all believers. God has, however, established within the Church the order [Ordnung] that this office be administered publicly only by persons specially called to it, who are apt to teach, and who now, in a special sense, by virtue of their office, can act in the name and in the stead of Christ. But because the Church has the office originally, so can and shall every Christian make use of this privilege, where its order is not overturned. [This may happen,] for example, among the heathen, or where the need supersedes the order, when, for instance, no preacher is present to baptize a child who is near death, or when within the Church a wolf opens his mouth, and whom then every Christian has the power to contradict, indeed, the duty and responsibility to do so. This doctrine, which condemns Rasmussen’s practice, is found throughout Luther, and there is no statement of Luther, either from his earlier or later period, which contradicts it. It is completely immaterial whether Luther at various times has variously based this doctrine in the Scriptures, in view of the question that we are dealing with here. Suppose the earlier explanation of Luther of 1 Corinthians 14 was to take precedence over the latter; still the matter is not altered in the least. For in that [earlier] document he only bears witness that the Office is no monopoly of the “shorn,” such that it could not also be administered by a layman among the unbaptized heathen or in the case of emergency. But who denies this? Such was the case with Apollos, who also apparently had an immediate enlightening or even an extraordinary equipping of gifts, which were only extant at the time of the apostles. Only stupidity and maliciousness can assert that Spener [1635–1705] had a different doctrine that he developed in his tractate on the spiritual priesthood. Regarding students and candidates who also occasionally preach, this is a weak help [for the argument of the opponents]. For these men preach in order to maintain the order of the preaching office, not to overturn it. Their sermons are exercises, preparations, and examinations so that in the future, they may be placed into and established in the preaching office. They do this therefore not as laymen, but as Tertullian [d. ca. 220–240] says, as “episcopi aut presbyteri aut diaconi discentes” (bishops or elders or deacons in the process of learning) (Kirche und Amt, 385). To that end it happens that their sermons are thoroughly evaluated. They subject themselves thereby at the same time to the election of the Church. . . .
From At Home in the House of My Fathers: Presidential Sermons, Essays, Letters, and Addresses from the Missouri Synod’s Great Era of Unity and Growth, pages 138–40 © 2011 Matthew C. Harrison, published by Concordia Publishing House. All rights reserved. 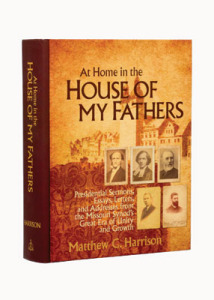 To order At Home in the House of My Fathers, please contact CPH at 800-325-3040 or visit www.cph.org.